Hello. My name is Lynda, <standing up facing the group now> and I am a beginner knitter. I come here freely to the Beginner Knitter Status Addicts (BKSA) meeting seeking the help and support of the like minded. I confess. I have been this way since 1972. I want to change, I really do. Once, I even tried to get saved by following the teachings written in the bible "Knitting Without Tears" by <genuflecting with head bowed> Elizabeth Zimmerman. But, somehow EZ didn't speak to me. No, not even she could help. Oh sure, I laugh along with the Yarn Harlot and I can relate to her knitting humor. Of course I follow her on twitter, who doesn't? 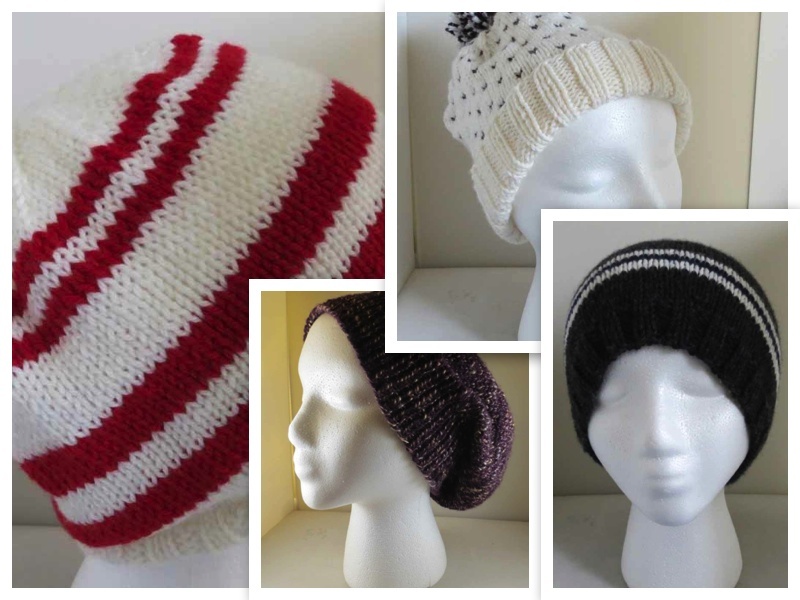 Yes, I am an upstanding member of Ravelry, one among two million. 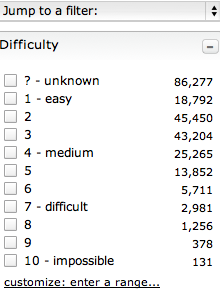 But could it be that Ravelry contributes to my BKS addiction by making it too easy to narrow my search down to the 18,792 easy patterns? Here is what I believe may be my downfall and inability to progress to the next level. I despise the concept of gauge and I balk at swatching. I tried it once, swatching I mean. I dutifully knitted the 4x4. 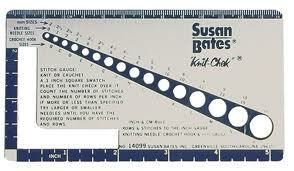 I used my Susan Bates "Knit Chek" thingy. I strained my eyes trying to count those V's. My count came to just under 1/2 of a stitch from what it was supposed to be. Or was it over? I can't remember. Do I go up a needle size or down? Who knows? Yeah, yeah, I know, I know. Gauge and swatching. Swatching and gauge. I hear the sneering, jeering and mocking from the Masters. "You'll never amount to anything until you respect your gauge and swatch that 4x4 until you get it right." There is something I just don't get about this swatching thing, though. So, if I go into a store and pick out four pair of pants, made by four different manufacturer's and each one is a size 8, how come they all fit differently? Relating that concept to say knitting a sweater; what is a size small, medium or large? Can all smalls, mediums and larges really be exactly the same. I think not. The thing is I love to knit. I love the motion, the mind numbing repetition, the clicking sound of the needles. I love the colors and textures of yarn. I love stashing and looking through my stash. I love searching for patterns. 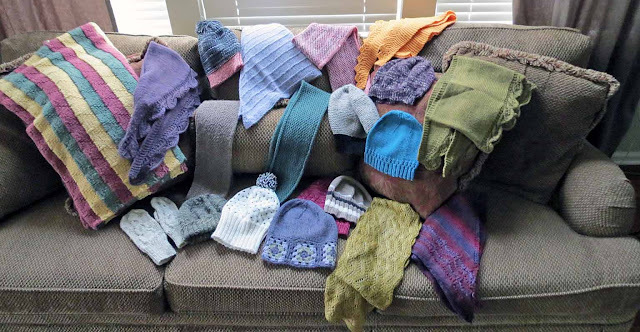 I love browsing through the photos of the WIP's or completed projects made by the talented other 2 million Ravelry members. I am in awe of the designers who conjure up wonderful images in their minds and then carefully and patiently translate those images into practical instructions for me to easily follow. And I am inspired. I admit I have dabbled with cables and yarn overs and lace. I can knit on all fours (needles that is) and I have made a Saryoan or two. I have even gifted my knitting. So, if that sweater doesn't fit Bella, I will just find someone else who can wear it. 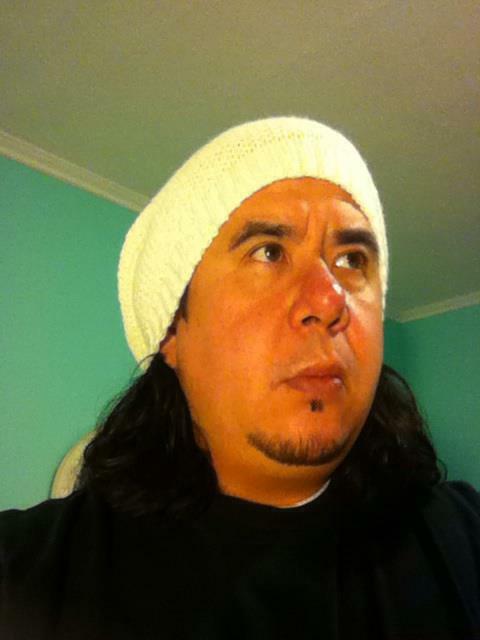 Or if that hat is too big for Jimmy, he can pass it on to one of his friends. Although I may never understand swatching, I won't stop knitting for it has provided comfort for me in so many ways. I have knitted through illnesses, and deaths. Two of my most treasured memories are sitting quietly with Joe while I knitted as he dozed and remembering the last time I saw him wearing that scarf I had lovingly knit. I light up when I see my sister wearing the shawl I made for her. I have felt joy from the glow of a smile from a grateful recipient. I have found warmth, curled up with my needles and yarn on cold bleak days. I have soothed an aching head with a woolen hat and eased the pain in my neck with a soft squishy cowl. Hmm, so after all is said and done, perhaps holding onto my BK status isn't so bad after all. Maybe a scarf or shawl? How about some mittens? A CAPTCHA is a program that protects websites against bots by generating and grading tests that humans can pass but current computer programs cannot. For example, humans can read distorted text as the one shown above, but current computer programs can't. I don't get tons of comments, but my apologies to those who are kind enough to leave comments, especially to my loyal and treasured blog friends. But I love seeing your creations, Lynda! I am the only one who knits in my family. Luckily for me Ross seems really interested in my projects. He now even understands the lingo. I am glad you enjoyed my finished works. Oh how nice to meet you! I'm a perpetual beginning knitter, too. I make scarves and baby blankets. The baby blanket "recipe" is the only pattern I can decipher. Which when you think about it, a person with a math degree who can do differential equtaions ought to be able to break a code they give you a key for..but alas, my skill does not extend in that direction. Nor can I hook up a TiVo, stereo, Wii, Xbox, or surround sound. Luckily, I have The Engineer for that. And the computer tech guy (aka The Transporter) and the Young Apprentice (who wants to be an electrical engineer like his Dad and is 13 so I never have to take out trash, hook anything up, and I've never mowed a lawn. Ok, probably more than you wanted/needed to know at this time, but as one of the co-hosts, I'm just wandering around the list saying "hi" and introducing myself. Hi! Nice to meet you too. I have just started to also wander around the list. I will most likely "see" you later. Thanks for the advice about the captcha. I will turn it back on, because it doesn't seem to have made a difference with the spam. It's not that spam comments are getting through, but my site is getting slammed with many, many more page visits than normal. It just annoys me that my blog is apparently being used as some kind of gateway into another site. Looking at your photos, I'd say you have moved on past the beginner stage. 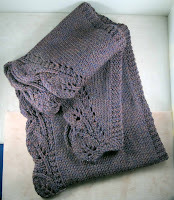 I've been knitting for over 50 years and only knitted my first tension square last month. I was knitting a jumper and the fit was crucial. Otherwise, I don't bother. Thanks, Una. I guess I really have moved on to at least a tad bit above beginner.